Learning the songs of singing insects is both challenging and fun. It is very exciting to being able to put a name to the singer that you are hearing. The first thing is to become familiar with the terminology for the various sounds these singers make. Syllable — an individual note that is produced by the engagement of one tooth of the file with the scraper. Syllables form the basis of the following song types. — the quintessential sound of a cricket. Chirps are short, pure-toned sounds composed of one or more syllables and separated by brief periods of silence. — a long, continuous series of syllables. 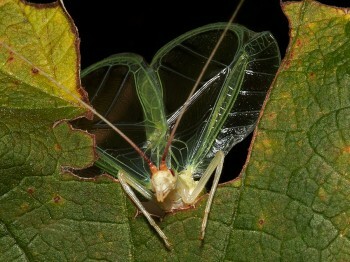 Pure-toned in the crickets and raspy or lispy in the katydids. — a brief, but drawn-out soft note, or notes, given by many katydids. — a short, staccato sound made by many katydids. — a brief, fuzzy note made by many katydids. — a long series of lispy syllables forming a trill. — a long series of harsh notes strung together; made by many katydids. When listening to the songs of singing insects, determine whether the song is pure-toned, as sung by crickets, or harsh, as sung by katydids. This will immediately place you in one “family” or the other and allow you to narrow down the identification much more quickly. Listen for the timing of the sounds, do they come as a short series, a long continuous trill, is there any pattern to the sounds, are the sounds harsh or mellow. With a little practice you’ll be amazed at how many species you can identify by ear. Remember, there are a few closely related species that sound very similar. To identify some of these songs to species you’ll have to record the sounds and then go to the Advanced Guid to Song IDs. A great way to learn songs and hear the differences between species is to listen to songs back-to-back. You can do this by going to the Thumbnail Guide to All Species page and clicking on the play button of the species that you want to listen to. Clicking on another species will stop the current player and start playing the newly clicked species. This way you can rapidly compare the sound of one species to another — a great learning tool. There are a number of closely related species of singing insects that sound similar to the human ear. Many are difficult to see and even harder to collect. Even then, their physical appearance may be similar. However, we can use their songs to separate these species. Since the introduction of the sound spectrogram in the 1950’s, humans have been able to “see” sound. Often called sonagrams or sonograms, these graphical representations of sound allow us to examine the fine structure of the individual notes produced by these insects. It is now easy to produce these sound spectrograms on your computer with free or inexpensive software. Our favorite programs for producing spectrograms are; Audacity, Raven Lite, and Raven Pro. These programs allow you to display more than one spectrogram on the same screen, thus facilitating the direct comparison of different recordings. Read the instruction manual for your software carefully, paying particular attention to the section for displaying and creating spectrograms. There are a few settings that determine the clarity of the final graph. In Raven Lite and Raven Pro, the ability to continuously change the “window” size is a real plus. This allows you to carefully tweak the appearance of the output to maximize the resolution between the frequency and time domains. You should use the same “window” type and size for each spectrogram when directly comparing similar sounds. Small changes in these parameters can profoundly affect the look and clarity of the resulting graphical display. Here is an example of the sound spectrograms of Allard’s and Tinkling Ground Crickets created in Raven Pro using the Hann window type and a window size of 155. While both species sing at roughly 7.5 kHz, the timing of the chirps is very different, Tinkling being about half the rate of Allard’s. The shape of the individual notes or syllables is very similar. Here is another example comparing two tree cricket species, the Four-spotted and Fast-calling Tree Crickets (window type =Hann, size= 133). Again, we can easily see that one species is singing at a higher rate than the other, but we can also see that the shape of the individual syllables is slightly different. So, while a recording of a cool Fast-calling Tree Cricket might sound similar to a recording of a warmer Four-spotted Tree Cricket, the shape of the individual syllables would clearly differentiate the two species. Direct comparisons of the sound spectrograms of an unknown singer with exemplars of known species is a great way to nail down an identification. This kind of careful analysis has shown that the known range of some species is not very well established. There is also evidence that several species of singing insects are on the move, following warmer weather as it creeps farther and farther north. The key to producing outstanding looking spectrograms is to start with a high quality recording. The clearer the field recording the clearer the spectrogram. While the Raven software prefers to work on digital files that are mono, 22kHz sampling rate, and 16 bit word length, it is best to record at the highest rate your recorder can achieve and then down sample the files before loading them into Raven. We routinely record singing insects at 48-96kHz sampling rate and 24 bit word length. Getting the microphones as close to the singer as possible is also a requirement. Be sure to monitor the recording with headphones and watch the meters on the device to prevent overload. If you distort the original field recording, there is no way to repair it in the lab. Currently, we are recording with Sound Devices 702 recorders, Sennheiser microphones (ME 62, ME 66, MKH 20, and MKH 60) as well as the Telinga Pro 7 stereo Dat parabolic system. Stellar recordings can be made with any number of currently available digital recorders. The basic requirements are the ability to; manually control the recording level, monitor the recording using headphones, use an externally connected microphone, and to be able to record at a minimum of 48kHz sampling rate and 24 bit word length. 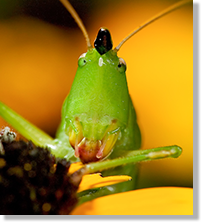 A note on sampling rates: The higher sampling rates of 96-192kHz are reserved for the smaller meadow katydids and the conehead katydids. It is amazing how much energy there is in the high frequency range of some of these insects. While the microphones that are listed above are not designed to produce a flat frequency response above 20kHz, they do an acceptable job of recording these higher frequencies for our needs. As long as the known and unknown insects are recorded with the same microphone, direct comparisons can be made. However, the shape and timing of delivery of syllables can be compared from one recording to another no mater what equipment was used to secure the samples.